This engrossing anthology gathers together a remarkable collection of writings on the use of strategy in war. 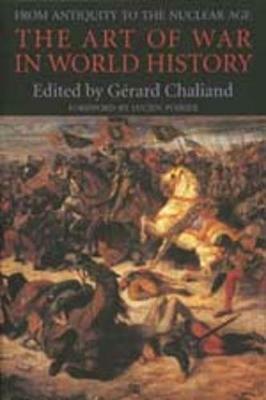 Gerard Chaliand has ranged over the whole of human history in assembling this collection - the result is an integration of the annals of military thought that provides a learned framework for understanding global political history. Included are writings from ancient and modern Europe, China, Byzantium, the Arab world, Persia, and the Ottoman Empire. Alongside well-known militarists such as Julius Caesar, Napoleon, Walter Raleigh, Rommel, and many others are 'irregulars' such as Cortes, Lawrence of Arabia, and even Gandhi. Contrary to standard interpretations stressing competition between land and sea powers, or among rival Christian societies, Chaliand shows the great importance of the struggles between nomadic and sedentary people, and of the conflicts between Christianity and Islam. With the invention of firepower, a relatively recent occurrence in the history of warfare, modes of organization and strategic concepts - elements reflecting the nature of a society - have been key to how war is waged. Unparalleled in its breadth, this anthology will become the standard work for understanding a fundamental part of human history - the conduct of war. 'This anthology is not only an unparalleled corpus of information and an aid to failing memory; it is also and above all a reliable and liberating guide for research...Ranging 'from the origins to the nuclear age', it compels us to widen our narrow perspectives on conflicts and strategic action and open ourselves up to the universal' - from the Foreword.